Here on this blog I frequently talk about the importance of embracing adventure in your life. How adventure means different things to different people, but that it is accessible (and necessary) for everyone. Adventure for you might mean going camping for the first time. It might be trying a new cuisine at a local restaurant. It might be talking to a stranger at the bus stop. The merits of your adventure don’t especially matter to society. They needn’t be profound to humankind in order hold profound changes for you. Adventure at its most fundamental is embracing risk and uncertainty. Maybe everything goes smoothly or maybe things backfire in your face. 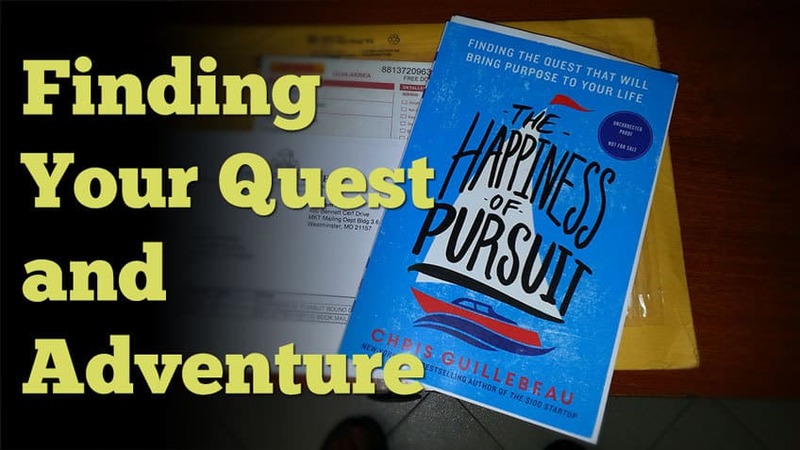 I just finished reading Chris Guillebeau’s new book, The Happiness Pursuit: Finding the Quest that Will Bring Purpose to Your Life. I have been a big fan of Chris and his blog for some time. I will say outright that his work and story have played a large role in shaping the current direction of my life. I was sent an advance copy of the book here in Medellin for review purposes. The book at its core really aligns with my thoughts about the crucial role that adventure plays in our lives, more specifically this book identifies the importance of adventure within the context of quests. A quest, as defined here, is some type of adventure which has a definite beginning and end, measurable results, and which requires some sort of sacrifice in order to pursue it. 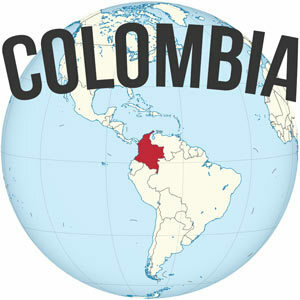 As an example of things that would qualify as quests: walking from one coast of the United States to the other, climbing the highest point in all 50 states, cooking one meal per week from every country in the world in alphabetical order, riding bicycles across the length of North and South America, visiting every country in the world (as Chris himself did), and so on. There are many, many examples of different quests of all types that are recounted within the book, from athletic to creative endeavors. While I have embarked on some big adventures, mine tend to be more open-ended, and would not meet the definition of a quest as laid out here in the book. My journey thus far has not been measurable. I do not think that adopting an adventurous spirit requires you to undertake a precisely outlined quest with a specific beginning and end, but I *do* think taking on a quest can be extremely beneficial in fostering an adventurous attitude. Structure and order can serve us tremendously. Science and psychology shows us that the more options we have in front of us, the more difficult it is to make a decision about something. If everyday is an absolutely open book, it can be hard to figure out your next steps, trust me. If you don’t know where you want to go, it is really hard to get there. Setting a specific goal to climb every 14’er in Colorado, to read every book in the Personal MBA, to write 750 words per day, or to earn $1,200 per month without a standard desk job–those are all things that you can easily see whether you’ve accomplished them, you’re making progress, or you’re not. The Happiness of Pursuit provides an outstanding framework through each phase of a big adventure or quest. The foundation needed to embark upon a quest–a feeling of dissatisfaction, following what gets you fired up, and a realization that everyday counts. The realities of embarking on a quest–not everyone will understand your goal, the need to understand the time and money ramifications to pursue it, the motivations that keep us going, and the monotonous reality of big adventures. As well as the longer term ramifications of these quests–your effort itself is a huge reward, the challenges provide opportunities for growth, small successes lead to bigger goals and more ambitious ideas, and sometimes you are left with a feeling of disappointment upon accomplishing it. Even though I haven’t really set out on a quest as defined by this book, I can relate to many of the thoughts and sentiments outlined above–anyone who has long held a mountain summit in their sights and then finally stands on top can probably relate. 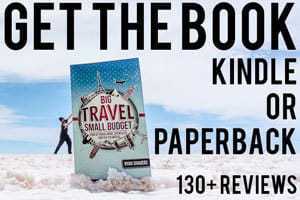 I always find it interesting to read the negative reviews or criticisms of a book like this, a heavily research, sourced, and motivational book, which profiles ALL types of adventures from the more over-the-top and expensive endeavors to the do-it at home, costs almost nothing ones. No, he’s absolutely right. Only you can figure out where the money will come from. 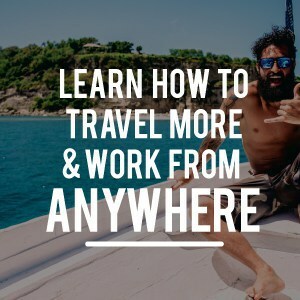 Only YOU can figure out whether you can afford to embark on an adventure–but no, you needn’t be a member of the privileged classes. Perhaps more importantly: if this is how you see life, that undertaking an adventure (whether big or small), and that going after something you really want is truly too risky to be worthwhile, can you afford NOT to do it? Yes, it will require sacrifice. No, it will not be easy. But doing hard things matters. Will it be worth it in the long run? In my opinion, yes, absolutely. We shouldn’t live in a cocoon of safety without risk, without uncertainty, without challenge. And certainly not without adventure. The Happiness of Pursuit is an excellent and inspiring read, which left me reconsidering how I have undertaken my adventures to date. Pick it up, absorb what is helpful to you and discard the rest, but most importantly: find your quest and adventure. P.S. 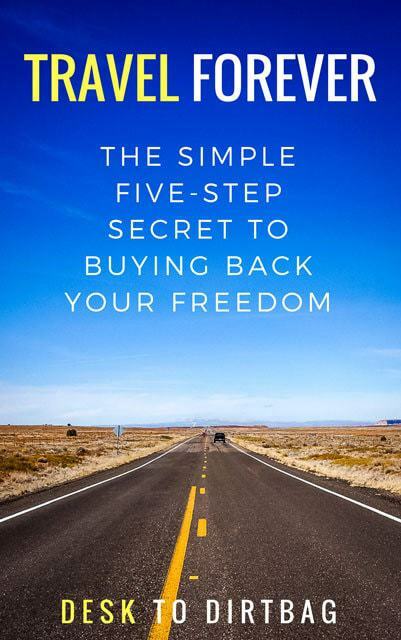 I’m hard at work wrapping up my upcoming ebook about breaking away from the 9-5 and living the dream. Be sure to put in your email address below to get it absolutely free on launch day! “What does a man need – really need? A few pounds of food each day, heat and shelter, six feet to lie down in – and some form of working activity that will yield a sense of accomplishment. That’s all – in the material sense, and we know it. But we are brainwashed by our economic system until we end up in a tomb beneath a pyramid of time payments, mortgages, preposterous gadgetry, playthings that divert our attention for the sheer idiocy of the charade. Speaking of climbing all Colorado 14ers, did you hear about the dudes who climbed them all and connected them all on foot? Google “14ers thru hike” and check it out. Looks like a freaking awesome adventure.